Alembicize a Guild M-85 II solidbody? It's a great bass, but the pickups are a bit underwhelming. It sounded alright once I ran it through my SF-2: https://soundcloud.com/stanleylighthead/walk-right-through-your-door But it would be nice to get a nice clear, deep sound right off the bat. Some kind of Bi-Sonic clone would be one option (Dark Stars having vanished it would have to be something like Chi-Sonics), but the Dave Schools Starfire I has me jonesing for Alembic of course! Could Anniversary or Signature electronics fit? Or just go Activator? For the time being I plan on sticking with the bridge assembly as is - it kinds of works with the fretless - though really Alembicizing the instrument is an interesting idea too. Please note, this really is just dreaming, this is kind of low on the priority scale - I just don't play enough fretless to warrant it, plus there are other projects like having my doubleneck brought back to Bass VI territory - but it's fun to imagine! I guess the place to start would be to determine what the dimensions of the pickup and control cavities are. Also what are the diameter of the pot mounting holes. Just a cursory look at the picture would lead me to believe Anniversary/Signature electronics are worth considering as most of the holes already exist and seem to have a lot of room between them. Can't say on the pickups but Alembic does offer a few options. You might also want to consider EMW with the current 5 hole layout it would only require one more for a Q-switch/control. The really important question is - do I want to be able to return it as stock as it was when I got it? It's in very good shape, but was missing the truss rod cover and original pickup selector bat - in fact, I wonder if the whole switch hasn't been replaced, the Guild bat is silver and very distinctive, not sure if it fits on a standard Gibson shaft which is what is on mine. But I think I would go Anniversary since that is what I am most comfortable with. EMW definitely sounds interesting, but I really like to set the bass outside of the instrument - I use a lot of effects, and prefer to tone sculpt the final signal instead of the signal before the effects. Alembic pickups and electronics would be the way to go, especially yummy with the fretless! 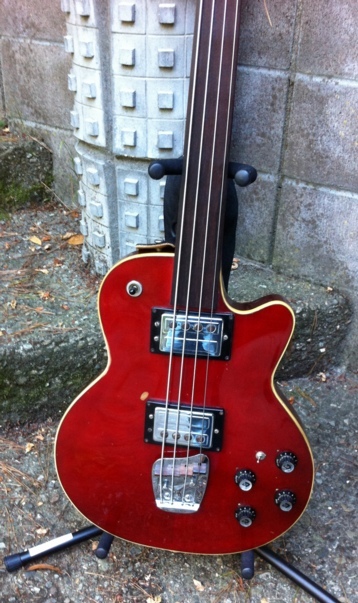 Agreed Edwin, it's a great bass as-is - with Alembic pickups/electronics it would be killer! A custom Alembic Activator kit with two discrete channels perhaps ? Volume / Filter & Volume /Filter ; wired with a stereo/mono switch. Also ; replacement of the existing pickup selector switch with a rotary Alembic type . As a cherry on top, replacement of all the knobs with the popular Alembic/ Raytheon old style knobs. To go the Whole nine yards Alembic bridge & tail piece with brass block. If you set the tailpiece back further you will be able to use long scale strings. I have two short scale instruments set up as such . You will hear a difference with the alembic bridge and brass block. Excellent ideas Wolf! Double Activator sounds pretty intense! I think I would be satisfied with just standard two pickups with single volume/filter. Not sure that they do pickup selector switch with such an Activator setup though. I really like the idea of the rotating selector in the existing spot - I tend to hit the current switch by accident when I'm in the middle position. Are the old Raytheon style knobs different than the current witch-hats? Bridge & tailpiece would be cool too, but I kind of like the current setup with flatwounds and fretless. If it was fretted I would definitely be more inclined to replace the harp bridge. Hello Harry , In old Raytheon/ Hat knobs I am just referring to the standard old non collet Alembic knobs . hi, great idea, nice bass! If you get the alembic pickups in, I would like to get your Guild humbuckers. zomnius, are you on the hunt for Guild humbuckers? People are really divided on these, some love them, most seem to hate them! I'm kind of on the fence - they are very powerful, but also kind of blah sounding. Harry brings out a note-worthy point here in my opinion as well . What really surprised me was that Guild is selling their re-issue Bi Sonics as our friend Taylor points out in thread above ! Like WOW man !!!!!! LOL __ I am really tempted to install two of those in a long scale Epiphone EB-3 that a friend of mine layed on me a while ago. I was thinking of also instaling an Alembic Strato Blaster ! Instant LESH 1970? That was a great sound . Add the Mcintosh 3500 amps , Alembic F2B ( or preamp out from Fender Dual showman) , Sunn Cabs with JBL K140 's and there we have it ? Peter is that correct ? Calling Cosmic Cowboy our equipment historian !